Whether for Hotels, Motels and Resorts or for Spas, Gyms and Cruise Ships or wherever the security of the unit and the integrity of your liquid amenities are important to you, The Dispenser has the solution! An extensive range of Lockable models to suit any situation or décor. With the simple turn of a key your Dispenser Lockable provides the additional security you demand. With the growing awareness of environmental issues regarding the manufacture and disposal of billions of individual plastic amenities bottles, The Dispenser is fast becoming a must in Hotels, Motels, Resorts and Spas everywhere and supports AAA Tourism Star Rating compliance. A proven support to Carer's and people living with infirmities. With one small change in the provision of guest amenities, you can achieve one giant leap for the environment and for your bottom line. And your guest's will love it too! Has the time come to change your thinking about your bath amenities program? The Dispenser eliminates the need for individually-packaged products. Think of the WASTE REDUCTION with this change! It is estimated that the world's Hotels must dispose of over 10 Billion pieces of packaging from Shower Amenities every year. And, the vast majority of these products are only partially used! You can make a difference for our Global Environment! Think of the harmful impact of the thousands of hardly-used bars of soap and half-full mini bottles your Hotel sends to the landfill every year. When you change to The Dispenser, you will reduce the WASTE from your Bath and Shower Amenity program to virtually nothing. When you purchase your liquid amenities in bulk, you are not just saving money, you are eliminating all the harmful waste of individually-packaged amenities. Just consider the impact on future generations if you (and other Hoteliers) do not change your thinking! Be a leader in this important Environmental Initiative! What is the cost of Individual Packaging Waste at Your Hotel? There are several considerations when you tally up the real cost of this approach. You are paying for the entire product that gets thrown away! 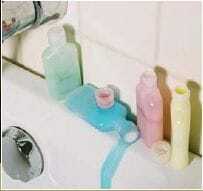 Bars of soap that are used just once, bottle s which are still three-quarters full. With The Dispenser you pay only for what your guests use, not for what is wasted (or taken home). There's a Housekeeping cost to the daily chore of restocking the cart, cleaning up the bathroom mess, restocking the room and disposing of the waste. You have to pay the WASTE REMOVAL costs for all the individual packaging. The ENVIRONMENTAL COST is the potential killer. Isn't it time to stop all the waste now? What is the real cost of continuing this cycle of waste? Your Hotel can't afford it and neither can the environment! Whether you operate a Bed & Breakfast or a thousand room Hotel, do your part for the ENVIRONMENT! Stop purchasing single-use amenities. Changing to The Dispenser will reduce your costs! Immediately and Substantially! You stop paying for expensive packaging and waste! Purchase Your Liquid in Bulk - not expensive 30 ml bottles of liquid and messy cakes of soap! The savings is significant. Pay Only for What Your Guests Use - you no longer pay for what is thrown away or taken home unused. Often, that's more than half your cost! Housekeeping Time is Reduced - instead of daily loading the cart, cleaning the mess and disposing of the waste, The Dispenser just needs topping up every 3 to 4 weeks, depending on occupancy. Waste Disposal Costs Reduced - with The Dispenser your waste is reduced to virtually nothing. Think about how much waste YOU produce in individually-packaged amenities. When you change your thinking, you save money IMMEDIATELY! Use our online Savings Calculator. Or contact us and we will help you - with the ultimate savings going to our environment. The Dispenser will win you praise from your guests. They understand the waste created by individually-packaged amenities. In survey after survey around the world, guests tell Hotel Managers: "We love The Dispenser Program." Guests understand the impact of waste! If you think you guests like little bottles, it's time to change your thinking! Guests love The Dispenser!